Research from UT Austin shows that rock salt, used by Germany and the US as a subsurface container for radioactive waste, might not be as impermeable as thought or as capable of isolating nuclear waste from groundwater in the event that a capsule or storage vessel failed. AUSTIN, Texas — Research from The University of Texas at Austin shows that rock salt, used by Germany and the United States as a subsurface container for radioactive waste, might not be as impermeable as thought or as capable of isolating nuclear waste from groundwater in the event that a capsule or storage vessel failed. A team of researchers from the university has used field testing and 3-D micro-CT imaging of laboratory experiments to show that rock salt can become permeable. Their findings, published in the Nov. 27 issue of Science, has implications for oil and gas operations, and, most notably, nuclear waste storage. The team includes researchers from the university’s Cockrell School of Engineering and Jackson School of Geosciences. Salt generally blocks fluid flow at shallow depth, a feature that allows oil reservoirs to form. But scientists have long suspected that salt becomes permeable at greater depth. Jackson School professor James E. Gardner confirmed this theory through laboratory experiments with synthetic rock salt. Cockrell School doctoral student Soheil Ghanbarzadeh tested the idea against field data from natural rock salt. During summer internships he examined oil and brine distributions in rock salt in a set of 48 hydrocarbon wells owned and operated by Statoil. The observed fluid distributions confirm that salt indeed becomes permeable at greater depth. However, the researchers were surprised to find that fluids were sometimes able to flow through the salt at shallow depth. In the study, they explain that deformation of rock salt may be the culprit. 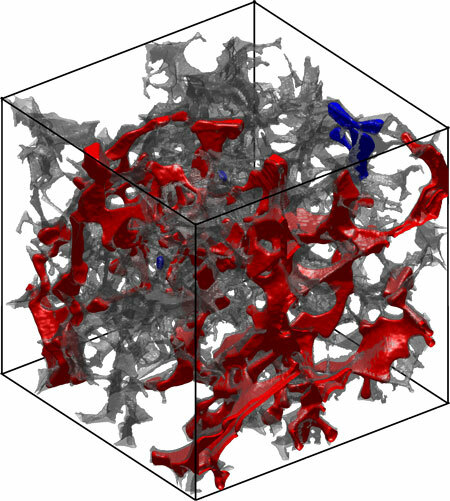 Deformation can stretch the tiny isolated pockets of brine that form between salt crystals and link them into a connected pore network that allows fluid to move. Although this work was originally motivated by the desire to evaluate rock salt as a hydrocarbon reservoir seal for the oil industry, the conclusions may have important implications for nuclear waste storage. Previous work on salt permeability has focused on the cracks induced by the creation of the nuclear waste repository itself. The observations reported by the study, however, demonstrate that undisturbed rock salt can become permeable. The Waste Isolation Pilot Plant, in Carlsbad, New Mexico, stores low-level nuclear waste in salt beds beneath the ground. However, high-level waste from the nation’s nuclear energy sector is stored at the power plants in pools or dry casks, methods that are considered temporary solutions. For decades there has been a proposal to build a permanent central repository under Nevada’s Yucca Mountains, but that proposal has stalled because of political and regulatory hurdles. This has renewed interest in rock salt as an alternative permanent storage solution for high-level nuclear waste. In this context, the findings of the team from UT Austin provide a timely reminder that rock salt is a dynamic material over long timescales. The project was sponsored by Statoil North America through the Statoil Fellowship program at UT Austin.